I think we are, to some extent, seeing new international law being written. 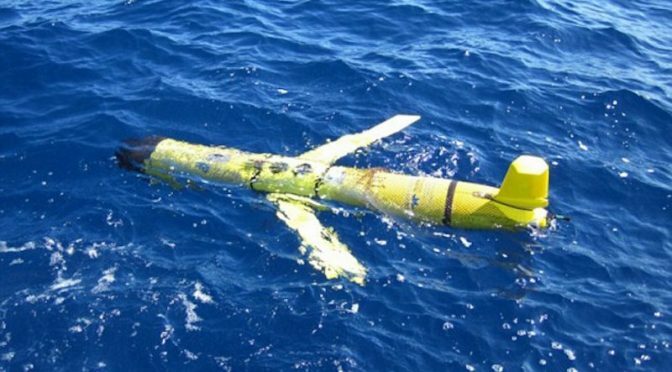 As one commentator noted, this is not a whole lot different from the Russians stealing US sonobuoy. 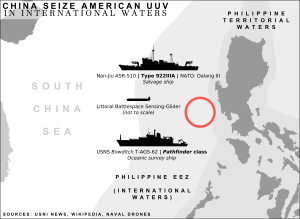 The fact it was inside Philippine EEZ is not significant . For this purpose, the incident occured in international waters. An assertion that this is like seizing a US warship will not hold water. It was a cheap shot. Still I think this is more evidence that our intelligence gathering vessels should be armed commissioned warships of the USN, not MSC. If you want to enforce the standing, historic international conventions of the seas without firing shots, then those who violate them need to be publicly shamed as peasants who slurp soup at the grownup’s table. They are already complaining we make too much of this incident indicating sensitivity, I’d beat them silly with it from deniable sources. We have an opportunity to bloody their public standing at home, breaking the cycle of propaganda of China as victim, without a shot fired and we would be remiss not to take it.